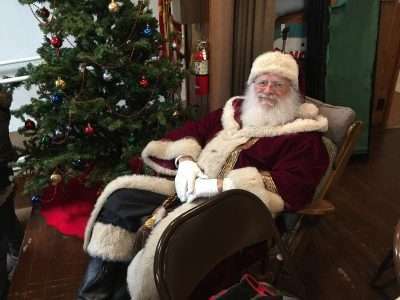 An unexpected guest waits patiently until the line goes down before gathering a plate at the Community Supper. 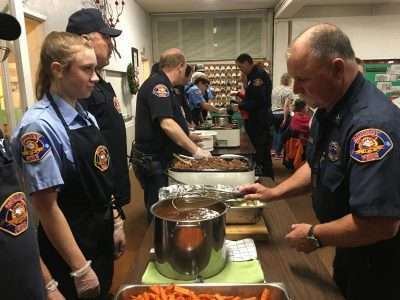 Local volunteer firemen made even more friends when they served up a fine meal of “meat and potatoes” at the Community Supper in Quincy on Dec. 19. A sumptuous feast of roast beef was ceremoniously delivered by a large crew of uniformed firemen to the Methodist Church. The basement dining hall was filled to the gills as residents took the opportunity to thank local firefighters one more time for their readiness at the helm over the summer that left Quincy, once again, in tact. “We have pot roast with mashed potatoes and gravy made from scratch,” said Community Supper prayer-meister Larry Trotter before offering a blessing of thanks and opening the serving line for the special meal. Cooked carrots, salad and homemade desserts also highlighted the pre-Christmas faire. 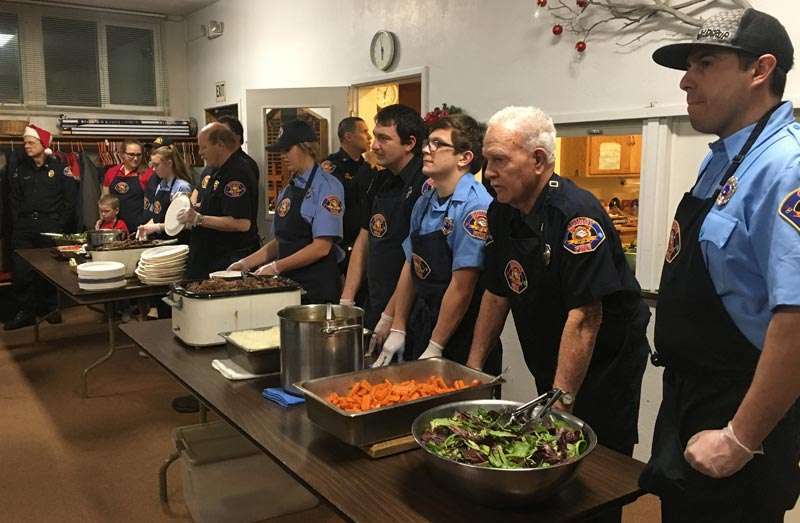 The Community Supper will continue in 2019 as it has for years to provide dinner to whomever stops by at 6 p.m. on Wednesdays throughout the year. The weekly feasts are planned, funded, prepared and served for the most part by various businesses and generous individuals. Each week the rotating sponsor is supported by a vigilant crew from the Methodist Church ensuring each meal, and cleanup, go off without a hitch. Diner numbers have exceeded 200 persons at times. Everyone is welcome and everyone is invited to join in community at the supper. A final pot of gravy, fresh off the stove, is delivered to the serving table. It’s six o’clock and true to form, the food is ready to serve up as uniformed firefighters get ready for words from Larry Trotter to the assembled group.